In his time as a North Carolina TEACCH therapist, Ron Larsen was involved in many workshops throughout the United States and United Kingdom, lecturing and supporting teams of participants as they worked with students on the autism spectrum. He brings over 22 years of practical hands-on experience, with individuals of all ages and abilities, to each workshop and talk that he conducts. Topics may include: characteristics of autism, how to facilitate independence, elaborating on TEACCH structured teaching, or establishing a work environment for adults on the autism spectrum. Talks may also be designed to accommodate your specific situation, addressing concerns that are of importance to you and your organization. With this experience, Ron is also particularly adept at organizing environments and designing visuals that would enable autistic individuals to be successful in mainstream business settings. This also includes an educational component for coworkers not on the spectrum, giving them an important understanding about specific needs associated with their new autistic coworker. This is accomplished in concert with the individual on the spectrum, to the extent that they are willing and able to do so. If you happen to be in or near Asheville, NC, and you would like a tour of the ShoeboxTasks vocational workshop, please give us a call, we'd be happy to see you! Ron also offers a free phone consultation with any purchase of ShoeboxTasks products. If you are interested in a consultation with Ron Larsen on how to structure a work environment to encourage independence and/or issues involving behavior management, or to schedule an informal vocational assessment for one of your clients or students, please contact Ron Larsen directly at ron@shoeboxtasks.com or call (828)252-5111. Ron Larsen worked as a Psycho Educational Therapist with the North Carolina University's TEACCH Program from 1991 until 2000 in Asheville, NC. 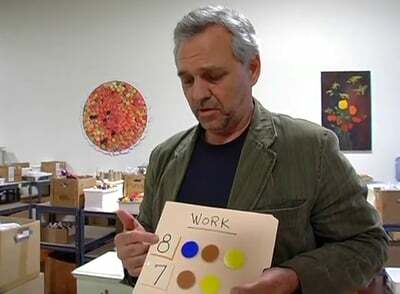 During that time, his work involved direct intervention with autistic children and adults, parent/teacher consultations, child/adolescent/adult evaluations, and professional presentations and trainings. During the mid-nineties while working in one-on-one sessions with young autistic children, Ron developed the design for ShoeboxTasks. The Tasks filled a need for activities that engaged the children's interest while promoting independence and success. Encouraged by colleagues within the TEACCH program, Ron and his wife Linda spent the next few years researching materials and resources before putting together the first 16 ShoeboxTasks activities, later to become the "Basic Curriculum." The business, named Centering on Children, Inc., began in their converted garage where a young man on the autism spectrum was hired with his coach to assemble and package the activities. As the ShoeboxTasks business grew, Ron left TEACCH after spending the last two years there as head teacher in a model-structured preschool class. Soon the business outgrew the garage and relocated to downtown Asheville, and a few years later, to its current location in a business park alongside the French Broad River. There are currently 37 ShoeboxTasks available and they are sold worldwide to families, therapists and schools. The ShoeboxTasks Vocational Workshop employs autistic adults who do light manufacturing and packaging, where they are valued employees and considered critical to the success of the business. In addition to ShoeboxTasks, the Sound Cylinders and Mystery Bag activities, the ShoeboxTasks Handbook: Activities Designed with Success in Mind, the ShoeboxTasks Educational CD, the TEACCH DVD, and a set of Folder Tasks are also available for purchase. Ron and Linda, along with their son Adam Larsen, also produced a documentary titled Neurotypical that describes autism from the perspective of individuals on the spectrum. The Point of View series on PBS aired Neurotypical during the summer of 2013 to widespread critical acclaim from film critics, those on the spectrum and neurotypicals alike.